It's been two years since Brother Ali released the critically acclaimed album 'The Undisputed Truth', and as the Rhymesayers lyrical heavyweight and producer Ant put the finishing touches on their upcoming follow up (Fall '09) the dynamic duo cap off the last two years with a new EP and a full-length DVD. It's been two years since Brother Ali released the critically acclaimed album The Undisputed Truth, and as the Rhymesayers lyrical heavyweight and producer Ant put the finishing touches on their upcoming follow up (Fall '09) the dynamic duo cap off the last two years with a new EP and a full-length DVD. Nine tracks featuring three highly sought after b-sides and six new and previously unreleased songs including "Philistine David", which was featured in the Jonathan Demme directed documentary, Jimmy Carter Man From Plains and "The Believer" a collaboration with Slug of Atmosphere. In addition to the new EP, The Truth Is Here also contains a full length DVD that features Brother Ali's sold out homecoming performance during The Undisputed Truth Tour at the legendary First Avenue nightclub in Minneapolis as well as interviews, a special commentary by Brother Ali, and videos of "Take Me Home" and "Uncle Sam Goddamn" from The Undisputed Truth. 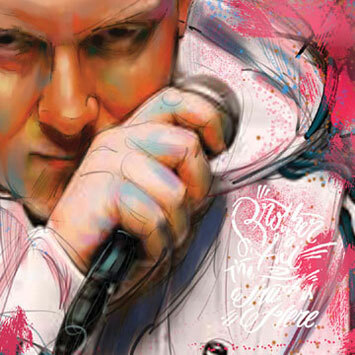 The Truth Is Here captures a key period in the career of what many have called one of the most promising voices to emerge from the underground this century and will be a must have for any and every Brother Ali fan.